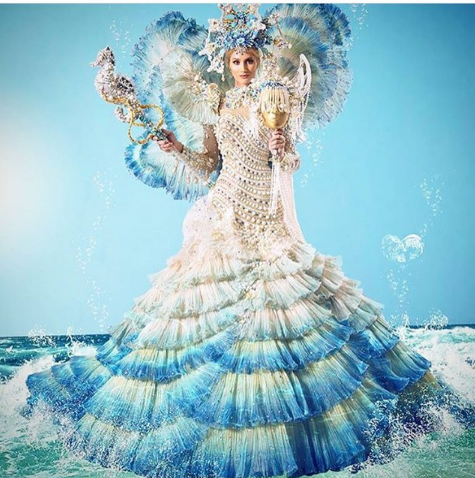 Miss Venezuela Mariam Habach's Yemaya-inspired national costume designed by Nidal Nouaihed for the 65th Miss Universe pageant. Yemaya is the Yorùbá Orisha or Goddess of the living Ocean, considered the mother of all. She is the source of all the waters, including the rivers of western Africa, especially the River Ogun. Her name is a contraction of Yey Omo Eja, which means "Mother Whose Children are the Fish." As all life is thought to have begun in the sea, all life is held to have begun with Yemaya. She is motherly and strongly protective, and cares deeply for all Her children, comforting them and cleansing them of sorrow.